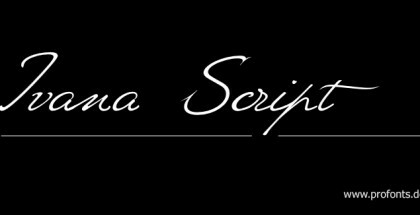 WindSong font family is almost everything you will ever need from a calligraphic script. Having own charm and tenderness this typeface is ideal for those types of work where emotional hand-made feeling is needed. These are wedding invitations, birthday and holiday greeting cards, even poetry. WindSong font is so elegant that it could be also easily used in cosmetics & perfumery as well as fashion, lingerie and other packaging. Because of its authentic yet refined look and enhanced legibility, this script is highly recommended for tattoo and wine label designs where every detail is of great importance. WindSong font family will perform perfectly if printed with hot-foil against textured paper. It will also surprise you with its enhanced performance when used as text fonts in smaller sizes for long text paragraphs – preserving its originality and feminine presence WindSong Pro will not disappoint you if you decide to use it 3 – 4 lines of text in size smaller than 10 pt. 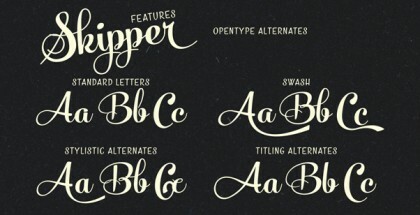 Fully OpenType compatible, this typeface will bring your attitude to calligraphy to a higher level – you will be able to act like a pro calligrapher within a single click of your mouse by picking customized letters from the alternates palette. You will find swashes, ending letters, freestyle terminals along with multilingual support, ligatures, etc. that will allow you customize your text the best way. WindSong font family is a powerful and sophisticated script typeface designed for professionals who want to implement the energy, beauty and authenticity of calligraphy in their work. Designed by the US based type designer Rob Leushke and published by TypeSETit type foundry.